An empirical relationship exists between storm tide, waves and coastal flooding or splash-over damage (NWS coastal flood study). Knowing this relationship helps predict when flooding and splash-over events (such as beach erosion) might occur based on forecast water level (tide height) and wave height data. 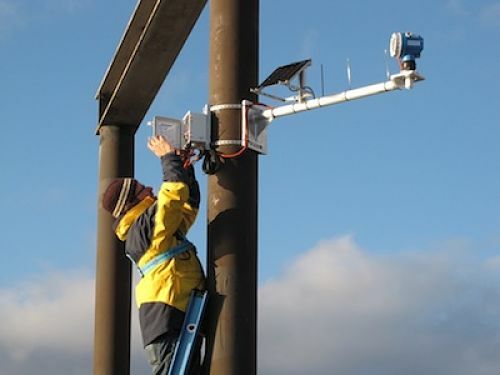 Scientists from the University of Massachusetts at Boston, center for Coastal Environmental Sensing Networks (CESN) installed a state-of-the-art tide gauge at the Hampton Fire and Rescue pier on Hampton Harbor to support the project. The installation of the gauge was funded via a generous donation by NextEra Energy Seabrook Station. Working with the National Weather Service in Gray, ME, NERACOOS, and modelers in the Northeast region, a working prototype for Hampton, NH, and Scituate, MA, locations was developed using a water level model (NECOFS/FVCOM) and wave model (Wave Watch3). This product could be used by emergency managers, coastal homeowners, and other users with interest and concern about beach erosion from large-wave storms. The capacity for the Coastal Flooding and Erosion Forecast system to predict damage days in advance of storms is extremely important to coastal property owners and emergency responders, resulting in dollars and lives saved.